Wedding flower decor in green and white hues. From wedding centerpiece to bridal floral bouquet. Photo shows a sample wedding table arrangement in green and white hues. Part of our wedding flower arrangements service including flower bouquet and bridal bouquet design. Free delivery in Metro Manila, Philippines. 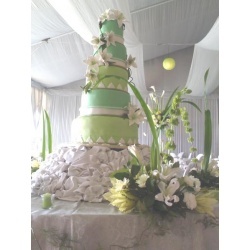 Wedding cake design and decor in green and white hues. 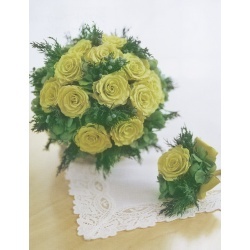 Part of our wedding flower arrangements service including flower bouquet and bridal bouquet design. Free delivery in Metro Manila, Philippines. 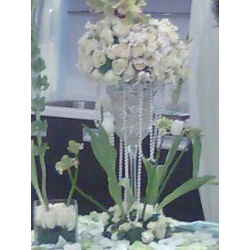 Photo shows a sample wedding decoration and arrangement. Wedding arrangement professional design and idea service. Photo shows a sample of wedding flower arrangements, decor and design by Florabella. Wedding Flower Arrangement service for the design of floral centerpiece in the church and on the presidential table of the wedding entourage. Please note that the price of Wedding Flower Arrangement for Centerpiece is listed as $0 because the actual price will depend on the chosen design, flower specifications and amount of labor involved in designing the wedding flower arrangement. Delivery of Wedding Flower Arrangement to your wedding location (church, etc) in the Philippines is included in the service. Make this special day memorable with 20 stems of tulips hand tied with fillers and matching sateen ribbons. We know weddings. Despite changes in fashion and style, couples still look for a meaningful wedding. Please call us for your flower needs us and we will take care of the rest. 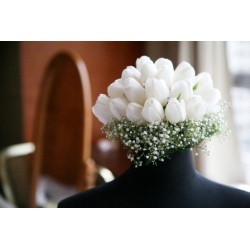 Flowers Selection for Bridal Entourage: Roses and Liliums. Please specifiy wedding color motif. 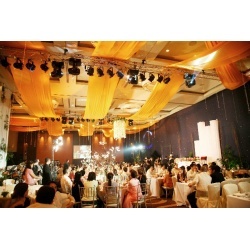 Weddings in the Philippines are one of the most anticipated celebration in a Filipina woman's life. You may select this wedding bouquet for the bride or as bridal entourage which consists of 1 dozen pink calla lilies hand tied with matching ribbons and fillers. Please call us to discuss your wedding floral needs and will take over the detailed planning. Check out the bag in hand which was personally made to go with the theme.